Worried about losing your fish to heavy rains and flooding? By taking preventive measures, you can keep your pond and fish protected. Check out these pond care tips before and after storms. If you’re in an area predicted to receive a huge amount of rainfall, you’d want to make sure that your pond is protected. In this regard, look out for possible cases of runoff. Runoff may contain chemicals harmful to your pond and more important, your fish. This is also why ponds shouldn’t be built in low-lying areas. If you have not yet installed an overflow drain for your pond, you might want to do so while the rain is yet to arrive. The overflow drain is designed to direct excess water so it doesn’t end up at your neighbor’s yard or your home. Also, don’t forget to cover the pipe with a mesh in case you have smaller fish that may accidentally fit in. If you already have an overflow drain installed in your pond, make sure it’s free of debris to prevent clogging. Get in touch with your pond builder for necessary pond equipment and supplies should you need to move your fish to a temporary home. Remember to get your fish back as soon as pond damages are fixed. Filters help you maintain good water quality for your pond. However, a filter is only good when installed properly. If you doubt the effectiveness of your pond filter, then you may want to work with a pond expert to help you install the right equipment correctly. A filter should blend with the existing landscape and be large enough to accommodate your pond needs. Along with the wind comes debris that can get carried into your pond. Protect your fish by netting over your pond. If you have outdoor furnishing around the pond, you may want to take them indoors for the meantime. Consider as well placing sandbags around your pond for extra protection. This will help confine your fish within the pond should flooding occur. 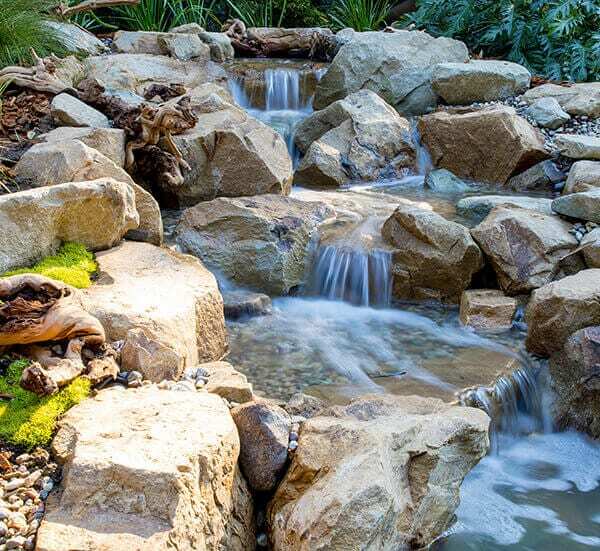 To accommodate stormwater and prevent overflowing, make sure to reduce water in your pond down to few inches. Check your pond as soon as it’s safe to go out. If you had sandbags, nets, or covers installed, you can now take them out so you can proceed to clean. If you found that the storm has caused terrible damage to your pond, you might need to take the fish out while taking care of necessary repairs. This is where you’d find the supplies you’ve prepared beforehand handy. You can use your kid’s inflatable pool as a temporary shelter for your fish. Your pond may have turned murky or green due to the runoff that altered the water quality. Don’t panic. After the pond has been filtered clean, the water should also get clearer after a few days. Check out this post for a step-by-step guide how to clean your pond, plus information on maintenance tools you’d need. It’s hard to call for assistance during and after a storm. So while the weather’s fine, take time to inspect your backyard pond. If you’re hiring a contractor for the job, talk to pond owners for recommendations. Pond care before and after storms would be a lot easier if the water feature is carefully installed.